A new labrid fish Terelabrus flavocephalus sp. nov., the third species of the genus, is described on the basis of a single specimen collected from the Republic of the Maldives. The new species is characterized by 46 scale rows in longitudinal series; 44 pored lateral-line scales; 13 gill rakers, including rudiments; main supratemporal sensory canal (STC) with 9 branches posteriorly; areas bounded by STC and postotic sensory canals (dorsal view) with embedded scales; least distance between anteroventral margin of orbit and maxilla 0.4 % of standard length; no red blotches superimposed on or extending onto midlateral red stripe; no yellow stripe on dorsal fin when fresh; a vivid yellow stripe extending from below the anterior margin of the orbit to preopercle and a vivid yellow blotch or band on the lower part of the opercle when fresh; a distinct black stripe from the center of the upper lip through the eye to opercular margin in preservation. This article was registered in the Official Register of Zoological Nomenclature (ZooBank) as 01B8CF1E-B069-41B7-AC6C-4B90E443C113. We are especially grateful to R. Kuiter (Australia) for providing underwater photographs of T. flavocephalus; G. Moore and M. Allen (WAM), A. Suzumoto, L. O’Hara, J. Randall, and R. Pyle (BPBM), H. Senou (KPM), and M. Gomon and D. Bray (NMV) for loans of specimens of T. dewapyle and T. rubrovittatus; O. Hayasaka and Y. Masuda (Kagoshima University, Kagoshima, Japan) for taking photographs of ovaries, and G. Hardy (Ngunguru, New Zealand) for reading the manuscript and providing help with English. We thank I. Atho Mohamed (Ministry of Environment and Energy, Republic of the Maldives) and M. Shiham Adam (Marine Research Centre, Republic of the Maldives) for permission to deposit the Maldive specimen of T. flavocephalus at KAUM. 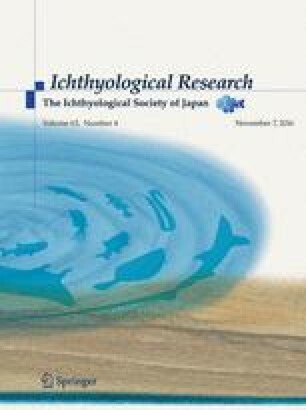 The first author thanks M. Nakae (NSMT) for providing information on sensory canals, S. Fukui (Kushikino, Japan) for input into the new scientific name, and H. Fukui, M. Fukui, and M. Fukui (Kushikino, Japan) for their kind support throughout this study. This study was supported in part by Grants-in-Aid for Scientific Research (A: 26241027, B: 24370041 and C: 23580259 and 26450265) from the Japan Society for the Promotion of Science, Tokyo, Japan.